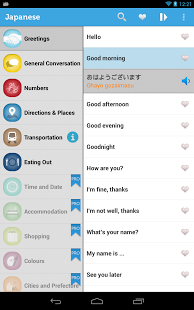 The most easy to use mobile phrasebook aims at tourists and business people visiting Japan. Turn essential words and phrases into native voice which you can practice or play it to local people to get around with confidence. Learn Japanese is recorded using native speaker and we have tried our best to be authentic in the pronunciation whilst ensuring it is easy to understand. 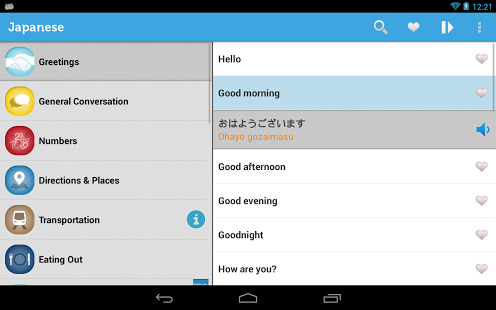 Recommended app for tourists and business people visiting Japan. We recommend you to use Wi-Fi connection the first time to download the database. 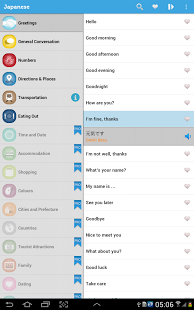 This lite version contains about 400 common words and phrases for FREE. Upgrade and unlock all 800 phrases in 18 categories.